UTC+14:00 is an identifier for a +14-hour time offset from UTC. This is the earliest time zone on Earth, meaning that areas in this zone are the first to see a new day, and therefore the first to celebrate a New Year. It could also be called the latest time zone on earth, meaning that clocks in this zone show the 'latest' (i.e., most advanced) time of all time zones. UTC+14 stretches as far as 30° east of the 180° longitude line and creates a large fold in the International Date Line around the Pacific nation of Kiribati. The central Pacific Republic of Kiribati introduced a change of date for its eastern half on 31 December 1994, from time zones UTC−11:00 and UTC−10:00 to UTC+13:00 and UTC+14:00. Before this, the time zones UTC+13:00 and UTC+14:00 did not exist. As a British colony, Kiribati was centred in the Gilbert Islands, just west of the old date line. The distant Phoenix and Line Islands were on the other side of the date line. Government offices on opposite sides of the line could only communicate by radio or telephone on the four days of the week when both sides experienced weekdays simultaneously. The revision of Kiribati's time zone meant that the date line in effect moved eastwards to go around this country, so that the Line Islands, including the inhabited Kiritimati island, started the year 2000 on its territory before any other country on Earth, a feature the Kiribati government capitalized on as a potential tourist draw. 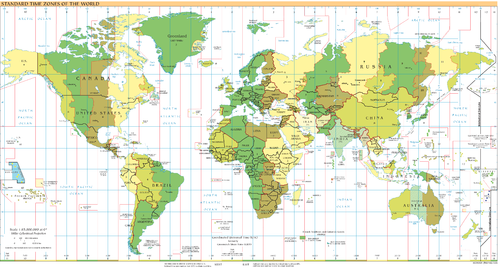 Tonga—IANA time zone database zone name Pacific/Tongatapu—used UTC+14:00 for daylight saving time from 1999 to 2002 & 2016 to 2017, and therefore celebrated new year 2000 at the same time as the Line Islands in Kiribati. At the end of 29 December 2011 (UTC−10:00), Samoa advanced its standard time from UTC−11:00 to UTC+13:00 (and its daylight saving time from UTC−10:00 to UTC+14:00), essentially moving the international date line to the other side of the country. Alaska (Russian America) had local times from UTC+11:30 to UTC+15:10 until 1867 (UTC was introduced in 1960). These times were local mean times and not time zones. UTC+14:00 was used as a daylight time before 1982 in the parts of very eastern Russia (Chukotka) that used Anadyr Time. ^ Ariel, Avraham; Berger, Nora Ariel (2005). Plotting the Globe: Stories of Meridians, Parallels, and the International Date Line. Greenwood Press. p. 149. ISBN 0-275-98895-3. ^ "Samoa to change time zones and move forward by a day". Metro. ^ "Samoa to move the International Dateline". Herald Sun.